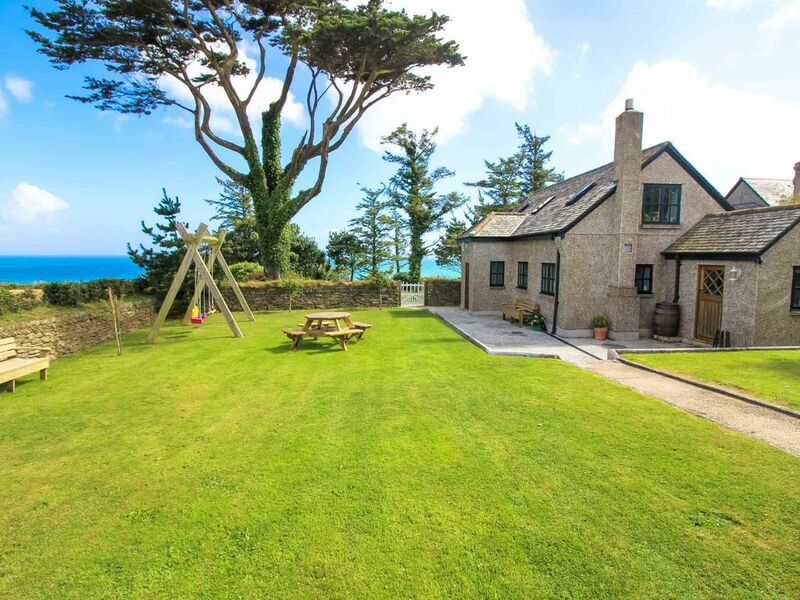 Amazing location on the Roseland Peninsula close to the coastal path. The Engine House is located on the dramatic St Anthony headland to the south west of Portscatho on the idyllic Roseland Peninsula. It is a quite beautiful conversion of an old engine house which once served the main house with electricity and water. It is a wonderful spot to spend a holiday. The property is fitted to high standards and will accommodate up to 4 people in 2 bedrooms. The kitchen is beautifully presented with an Electric Aga and granite worktops. The living room is simple but stylish, as are the two bedrooms and there is oak flooring throughout. The main property sits in 4 acres of land, the Engine House has its own enclosed garden area. The coastal path passes close to the end of the drive and from here you can explore one of the most unspoilt sections of Cornwall's dramatic coastline, with magnificent promontories, secluded coves and stunning beaches. It is a haven for walkers as there are miles of footpaths to explore. It is also only a short walk down the hill to Place, where during the summer season a little passenger ferry will take you across the bay to St Mawes from where you can catch ferries to Falmouth & Truro. This is true Cornwall at its most wild and beautiful. The coastline here is owned by the National Trust and the views all around the headland are fantastic. The beach at Towan (1 mile away) rarely gets very busy and the waters are clear and excellent for swimming. First Floor: Landing leading to main double room with 5' bed and sea views. Main bathroom has bath with handheld shower and WC. Twin bedroom with 3' beds. External: A large enclosed lawned garden with a patio area around the building, heavy duty swing set and a separate drive to main property. There is a BBQ but you will need to provide your own charcoal. Kitchen: Electric Aga, granite worktops & Belfast sink. Integrated fridge with freezer compartment, combi-microwave, dishwasher, washing machine, toaster and kettle. There is also a small freezer in the utility room. Lounge: Wood burning stove, TV, and DVD. WiFi is available at the property. Bed linen, towels, electricity and oil fired central heating are all included. There is space for 2 cars on the drive. Regrettably, no dogs are allowed and smoking is not permitted. Regrettably no children under the age of 3. &pound;150 security deposit pre-authorised on your card. A wonderful cottage in a beautiful location with such friendly and caring hosts! I would highly recommend this place as a quiet and picturesque base to explore that part of Cornwall. Lovely location. It takes a great deal for us to return to somewhere three times as it has to live up to The Cotswolds which is where is where we live and is quite beautiful, but the location has a different beauty, as in its remoteness, but with out feeling cut off. The sea breezes were especially appreciated this year. Thank you Jude for the rock cakes and hope your open garden goes well as it's beautiful. If you're looking for action and a wide range of eateries and music venues. This is NOT for you. This is the absolute best place we've ever stayed because what we need is seaviews, quiet and walks. The ferry is only a short walk away if you fancy a trip to St Mawes or Falmouth, but honestly. Just sitting in the garden looking at the ships sail by and then strolling along to the beach. That's enough for us. And the hosts are incredible. Lovely location. A little remote, which is what we like, sea view, lovely gardens - lots of space (inside and out) But I have to say missed the cakes upon arrival which we had in the summer. Loved learning to cook with an Aga. Only niggles are the mirror in the upstairs bathroom is a little too high, and things seem to be screwed down (lamps in double bedroom) Could perhaps do with another lamp in the large living room either floor or on a table (don't see the point of one being right next to the tv) But still love staying here. Our stay could not have been better. We didn’t want to leave will certainly go again. Very peaceful, didn’t need to leave the house there was so much to watch going by on the Ocean. Bed linen, towels, electricity & heating are all included. Please bring your own beach towels.